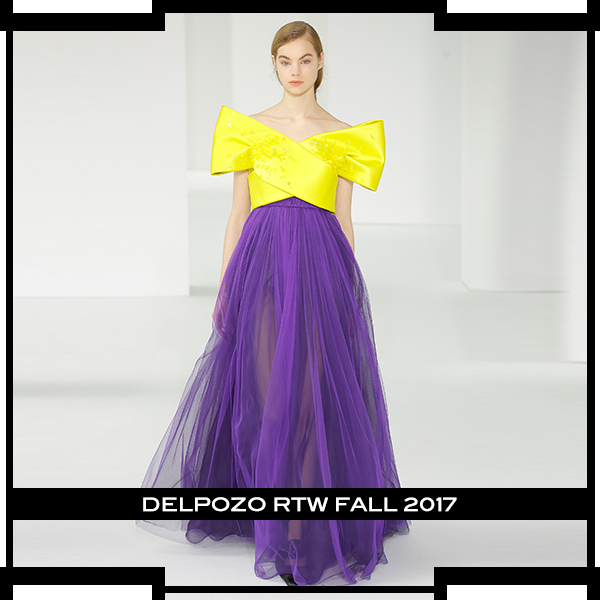 While glancing at Delpozo’s Fall collection, I couldn’t help but think of the models looking like sculptural paper dolls. 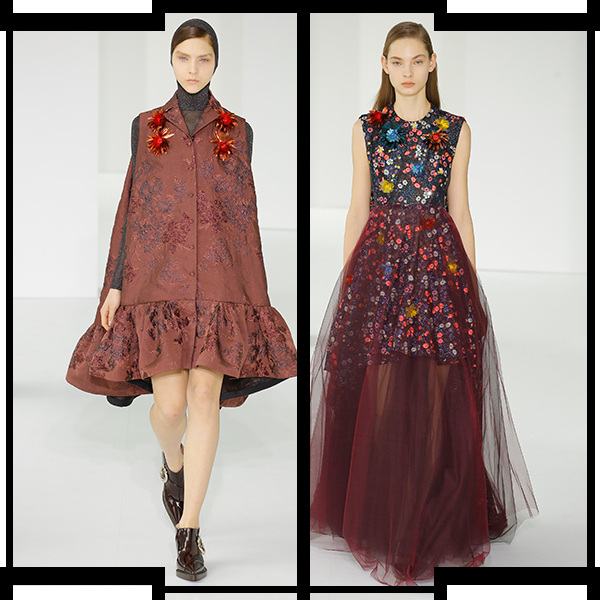 Paper dolls, known to be quite fragile + two-dimensional, Delpozo’s dolls were devoid of any hair more times than not, often covered with a hood, making them look like their paper alter ego. 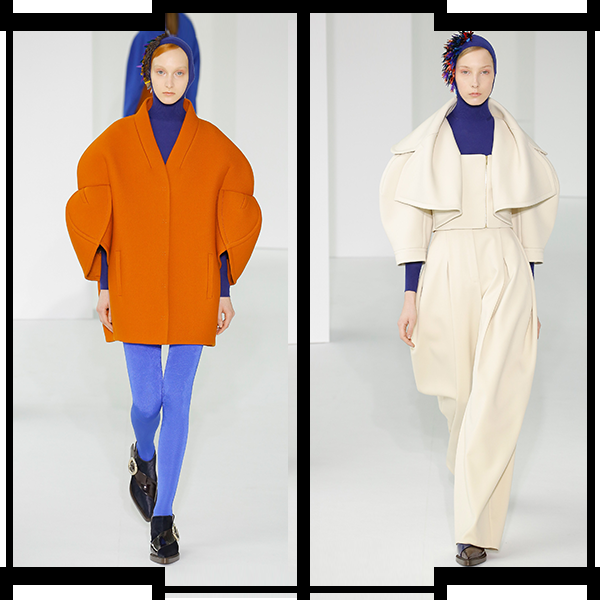 Now add sculptural geometric silhouettes to such a display + you can’t stop your mind to recollect images of Sixties futuristic fashions made popular by the genius André Courrèges. 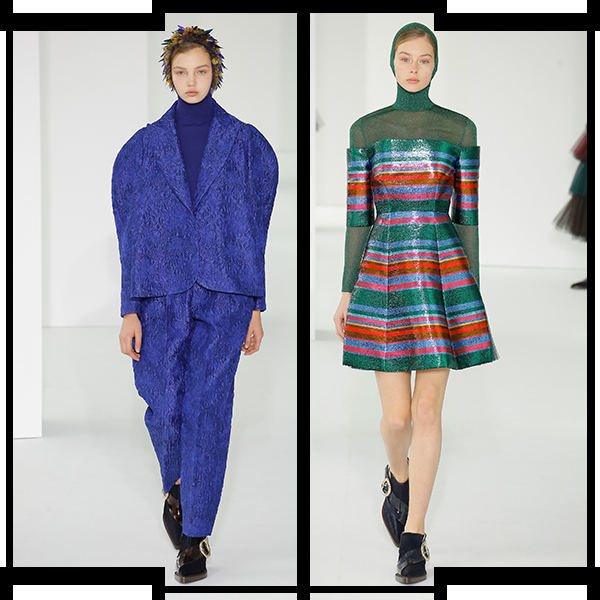 There were jackets with stiff bubble sleeves that looked like they were made of scuba material to retain their round shape so sternly while still respecting the female form with beautifully large lapels that curved around the neck, as they made their way down to their pointed ends. But their short length with an off-center front zipper gave the body of the jacket a flat corset look, minus the darts. 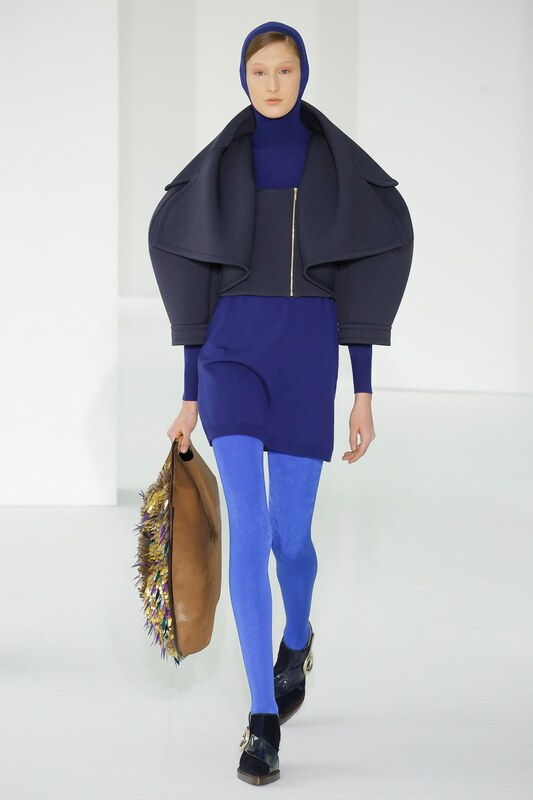 Other times, this same effect was applied to single-breasted coats with sleeves that were made of two parts overlapping at the elbow like elongated tulips. When darts were ever applied accentuating the female form, it was usually in that of a jacket with a peplum + large buckled straps similar to the top below. However, for the most part, these stiff shapes were softened by showing long legs in bright tights or pairing them with very flowy or baggy bottoms. 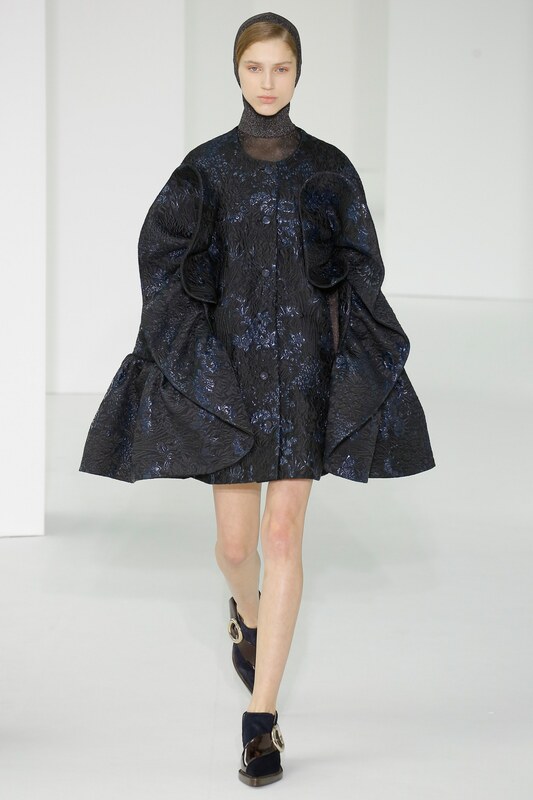 These heavily sculptured pieces created by designer Josep Font were then softened by applying the same architectural enthusiasm to more romantic silhouettes like a triangle jacket in a floral jacquard textile with metallic florals, highlighted by a large ruffle that started at the end of the shoulders descending down its sleeves turning into its ruffled hem. Paired with a black + blue sheer Lurex hooded top + you’re left breathless. 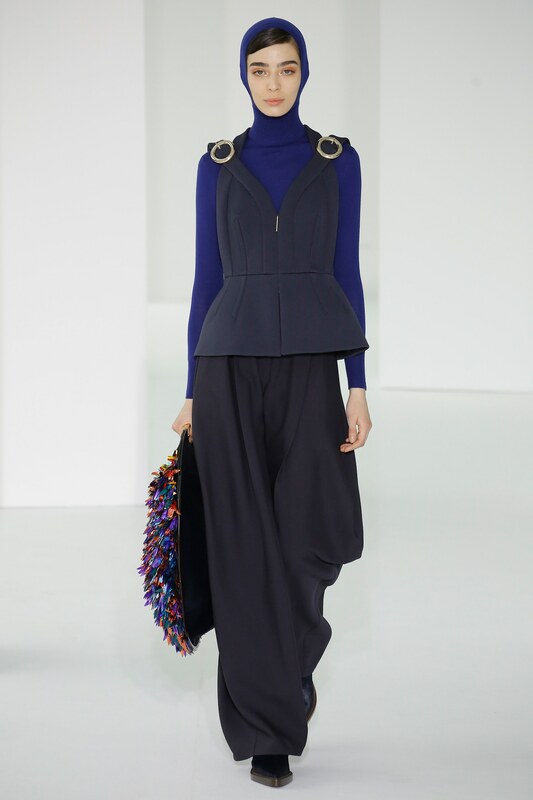 According to VOGUE RUNWAY, “Font works from art references—this season the rich palette was inspired by the Nabi painter József Rippl-Rónai, + the collection’s rounded shapes from the work of sculptor Max Bill,” + rightfully so when executed with such effortless precision. Even the buckles present in the collection were big circles themselves. Yet another component that made a lot of Font’s pieces stay with you like a loving memory was his use of pattern + various embellishments. 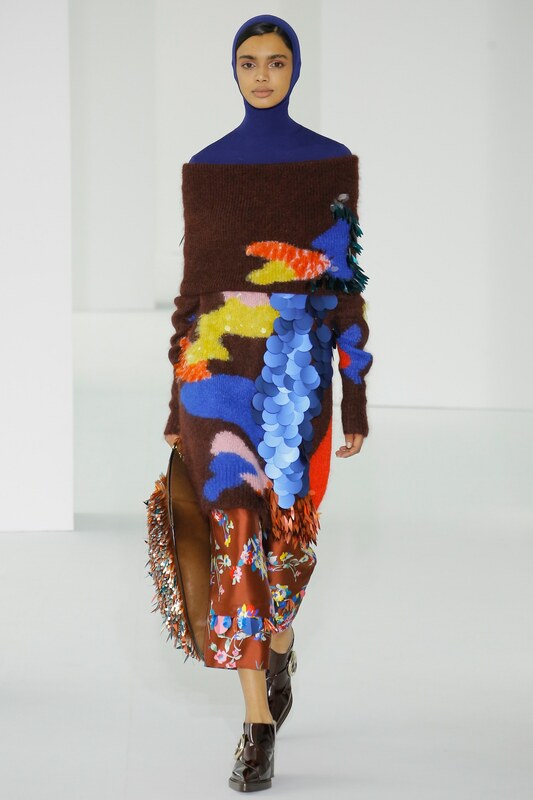 One such pattern was comprised of bright organic shapes on a knit rust colored sweater, embellished with large circular opaque + iridescent sheer paillettes in an array of colors, along with dangling metallic leaf shaped pieces that also covered the whole front side of a large circular handheld tote. Florals in what looked like clear colored plastic, decorated dress straps, jackets + dresses alike. 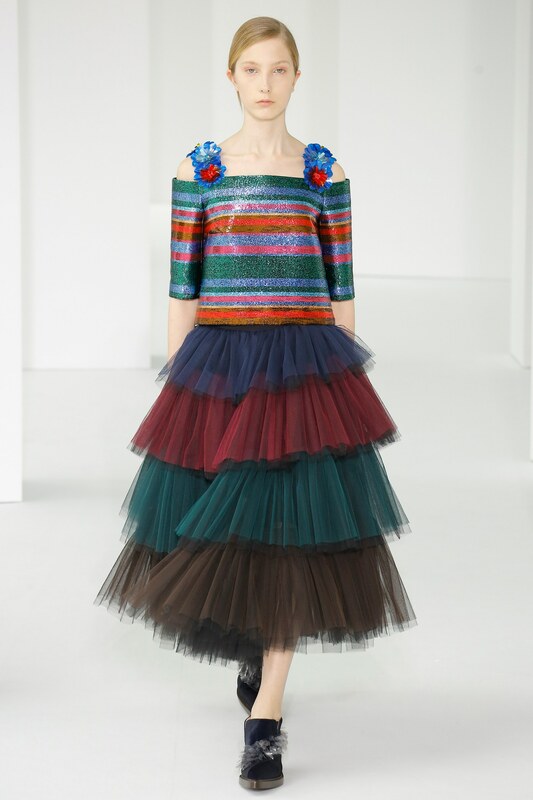 I especially loved the hint of these iridescent circular paillettes decorating the boot shoes as a diagonal strap from its top side to its inner ankle. 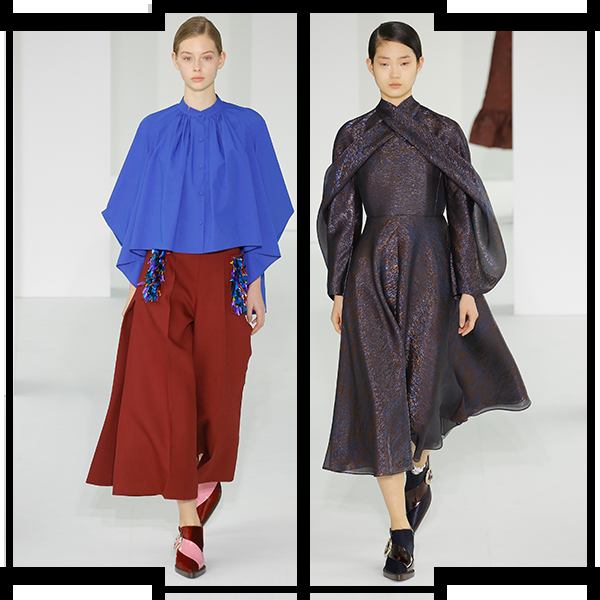 As a whole, the collection proved to elevate the female form by not focusing so much on how it’s shaped but rather on how shape formed the woman within. By shedding light on a woman’s personality, this woman’s strong point of view is clearly demonstrated by making such a strong fashion statement that is sure to set her apart from all the clones incapable of authenticity.